Jumeirah sceirah is the number one trilling ride located in wild wadi water park Dubai.It has the tallest and the longest water slides. All you have to do on jumeirah sceirah slide capsule is to take a deep breathe and wait until your ride starts after that, you will be slipped through tube shaped slides with cold water.The height of jumeirah sceirah slide is 32 meters and the length is 120 meters. Anxiousness and dry throat are common effects while travelling through the slide with the speed of 80km/h. Flood river is second best ride at wild wadi water park. Every age, height persons can enjoy this ride, this ride consists on a wide area filled with water and artificial waves are produced in it. All the riders ride in air tubes wearing safety jackets and the rides or tubes ride over 1 meter high waves of water , this ride is like you are surfing in a sea on a round shaped air tube.There are more than 5 rides in flood river and only one person can ride each ride. All riders are secured and safe in the supervision of expert swimmers monitoring each ride. Burj Surj is a family ride if you are family of 5 persons that means you are good to go, all the family member can enjoy this ride together. 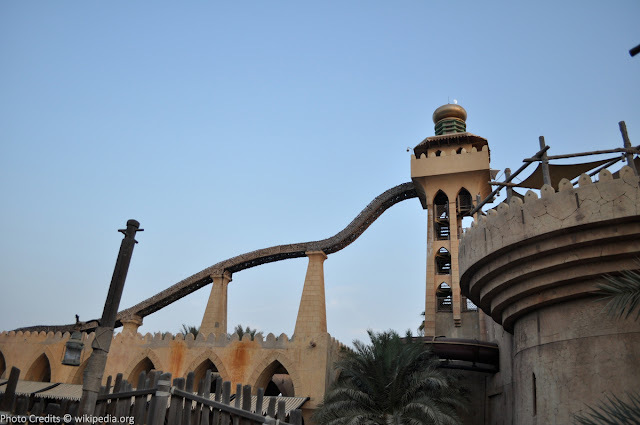 Burj surj is the 3rd best ride at wild wadi water park. This ride starts from a tower opening to a wide slide, all riders are sitting in a tube and travel towards the bottom of the ride through the tube sliding towards the end. It has some dangerous curves with amazing water openings and ending in a pool where you leave the ride. This ride is recommended due to safety and comprehensiveness. Tantrum alley and burj surj are located on same place lying side by side, both slides are the same but the main difference is Tantrum alley has water tornado attacking you on different spots and it has more speed then burj surj. This ride starts from the top checkpoint and ends in wide pool opening. Each ride in Tantrum alley consists of 4 hollow seat spots with minimum 2 and max 4 persons.It has humongous slides with ultimate speed. Wipeout and Riptide has the whole new and ultimate high-speed surfing experience. Wipeout and Riptide is very unique ride, there is not a such ride like this in whole UAE or may be in the Middle East. Surfing on Wipeout and Riptide made possible with such a powerful water shooting mechanism designed to shoot tons of water towards the surfer in fraction of second.The power of Wipeout and Riptide is its thrill.